Rose Floral Brocade Paper Bags 25 Pk 5-1/4x3-1/2x8-1/4"
Rose size Floral Brocade Paper Shopping Bags sold by the 25-Pack. This is a Nashville Wraps exclusive design! Made in the USA. 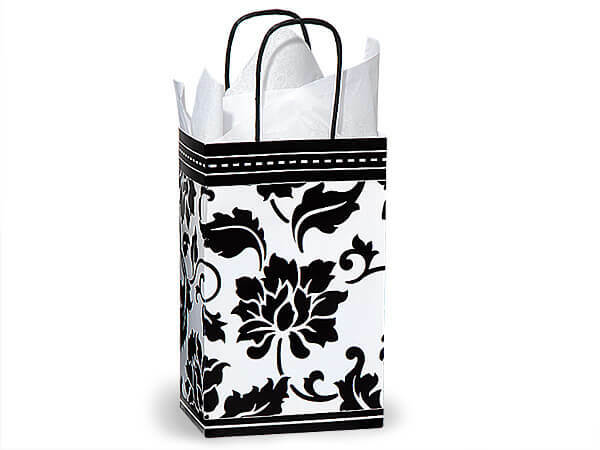 Floral Brocade Gloss Paper Shopping Bags make a bold designer statement. The black brocade pattern is accented with stitched ribbon band detailing on a white background. Individually UPC coded so great for resale.